Medtronic is such an amazing company, for so many reasons. Beyond that whole “create amazing medical products that help people live healthier, fuller lives,” they offer some incredible financial benefits to their employees to help them build a comfortable financial future. One benefit in particular is they give each employee and extra 5% of their pay which they set aside in a pension account. When you leave the company, they give you that money either in a lump-sum or they will give you a pension for the rest of your life. It’s an awesome benefit, but it involves a difficult choice: do you take the lump sum or do you take the pension? Here is how I made that choice, and the different factors I took into account. When I left Medtronic, my pension account had about $50,000 in it. Medtronic could give me that in the form of a lump sum, or, based on my age (38 years old), they would give me a monthly pension of $220 until my death. So which one did I pick? Which one would you pick? There’s something to be said for getting the cash all up front. Those monthly pension payments come only so long as Medtronic is able to pay them. Right now they are an extremely strong company financially, but we’ve seen many times how strong companies can fall on hard times and lose their way. This is especially true after major mergers (Time Warner with AOL, Boston Scientific with Guidant, etc.) and Medtronic did just merge with Covidien. I have absolute faith that Medtronic will be able to pay me, but if you get the money up front, that’s one less thing to worry about. When you get the money, it is usually rolled over into an IRA so you don’t pay taxes on it (if you take it in actual cash, there are major penalties similar to if you cashed out your 401k). So you aren’t paying taxes on the money when you’re younger and you’re probably in a higher income bracket. The biggie is that you get to invest that money and then have it available when you turn 60. For me that’s a 22 year time horizon so I could invest it pretty aggressively in the stock market knowing that over that long of a time the probability is extremely high that the money will grow a lot. Just using some basic assumptions, that $50,000 would probably be worth about $180,000 when I turn 60. You can use the monthly pension for today’s expenses. $220 isn’t a ton, but it’s still a nice chunk of change. Just looking at our budget, that could pay for our internet, cable, and car insurance. That’s not bad. Basically I’ll have those “free” for the rest of my life. A pension is a nice way to diversify. As I mentioned here, most of our savings is in stocks which is appropriate given our ages and personal situation. 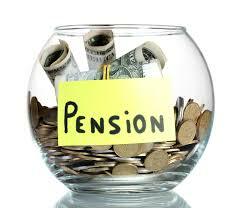 We have very little in bonds and other safer investments, so having a pension fills a little bit of a gap we have. When faced with the choice of taking a pension for $220 per month or getting a lump sum of $50,000, the pension is the better deal. If you shopped around for an annuity a 38-year-old male could get a $220 per month, and it would cost about $55,000. So basically by picking the pension option from Medtronic I’m getting an extra 10% compared to what it would cost me to buy it in the open market. There are good reasons to go either way. Foxy Lady and I struggled with this a lot. For us, it was a choice of going with your head (you’d choose the lump sum) or your heart (you’d choose the pension). Financially, it’s a much better option going with the lump sum because you can invest it and let it grow. When we’re 60 we could take all that money and buy an annuity worth $720 a month. Given that Foxy Lady and I don’t need the income right now because she’s working and I’ve found a little bit of work on the side, it’s a better deal to take the bigger number when we do stop working. But the heart wants what it wants. There’s something comforting about getting a tiny income stream now that you know will always be there. It’s not dependent upon the stock market or anything, and if everything did go to hell with the stock market in some catastrophic way, we would have this little bit. Plus, as I mentioned earlier, we have a nice little nestegg right now but it’s all invested in stocks. This provides a little bit of fixed-income diversification. For these reason, we ultimately decided to go with the pension. So there you go, a nice little primer on how to pick between a lump sum and a pension. What do you think? Would you have made the same choice? If you’re with Medtronic, what are your thoughts on the matter?